To say that Mac Rebennack, better known by his stage name, Dr. John, is a musical legend is at best an understatement—the man’s fifty-plus-year career is a display of nonstop musical talent, and he’s no lightweight in the music history of the United States of Americana. 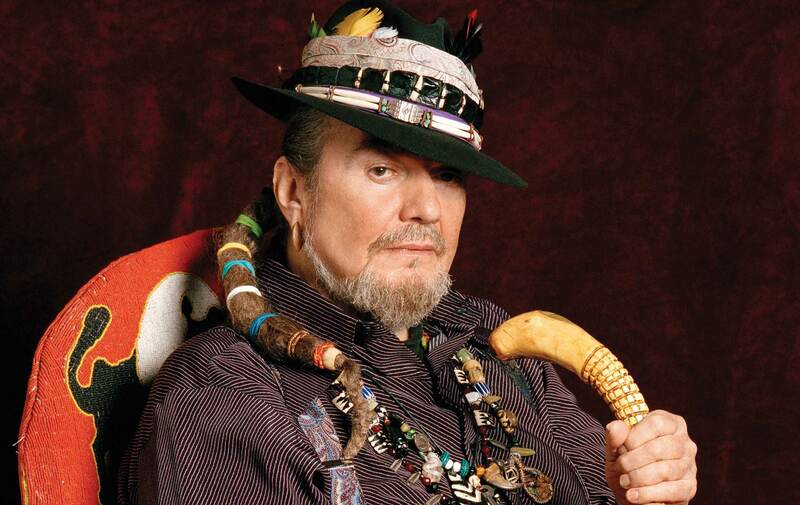 Dr. John has played or been a prominent part of the formation of jazz, zydeco, blues, pop, funk, and rock ’n’ roll. His shows are known to be theatrical, Creole swamp spirit–invoking, good-time events that are decidedly flavored with an element of New Orleans Mardi Gras spice and a hint of ceremonial voodoo. Dr. John is the distinguished recipient of six Grammy Awards and countless other accolades, he was inducted into the Rock and Roll Hall of Fame in 2011, and in 2013, he was presented an honorary doctorate of fine arts from Tulane University while sharing the stage with His Holiness the Dalai Lama. He has recorded over twenty albums and his most recent offering, Ske-Dat-De-Dat: The Spirit of Satch, is an album inspired from beyond the grave. Dr. John states, “Louis Armstrong was the most famous guy who ever came out of my neighborhood. So it was special to me when he came to me in a dream and said, ‘Do my music, but do it your way.’” Dr. John and the Nite Trippers are currently touring the U.S. and Europe in support of this album and Dr. John’s storied career. Every great musician that exists in the world today not only knows who he is, but refers to him for inspiration and for guidance to develop what they do. The sound of the Nite Trippers is a manifestation of Dr. John’s early years, the 1960s; it is a gleaming shadow on a crescent moonlit night told through the tongue of Miles Davis, the ears of the Aquarium Rescue Unit, the fingers of Professor Longhair, and the eyes of Sun Ra Arkestra—but you know how voodoo can be. The current incarnation of the Nite Trippers showcases Dr. John on vocals, keyboards, and guitar, Dwight Bailey on bass, Reggie Jackson on drums, Dave Yoke on guitar, Ben Alleman on organ, and musical director Sarah Morrow on trombone and vocals. Sarah Morrow is a triple threat as music director, trombonist, and vocalist for the Nite Trippers. VIE writer Chad Thurman was granted an exclusive interview with Dr. John and his music director, vocalist, and trombonist, Sarah Morrow. CT: Dr. John, you’re known for your own style of playing the piano; it’s part of the sound of Americana music. But in the past two years you’ve been playing your keyboards and guitar a lot during Nite Trippers shows. Is there a reason for that? DJ: That’s my first instrument. Over in Jacksonville, that’s where I got my finger shot. That’s what stopped me from playing the guitar a little bit—but that was a long time ago, in 1960. SM: Hey Mac, we’re flying into Jacksonville for our first show in Florida! SM: We have to have some kind of celebration when we arrive that night in Jacksonville. Bring your finger! The two share a good laugh. SM: We’ll thank the heavens, though, because, you know, thank goodness he turned to piano—it’s amazing that he couldn’t play guitar after he got shot but could still play piano the way he does. It’s amazing how he plays piano anyway, but to hear him play guitar, he has this feel and this bend like I’ve never heard from anybody—it’s so cool. The thing is, with the mysticism that permeates the man and his music, his aura onstage, and the allure of all within the spell of his auditory company, it’s hard to discern whether Dr. John and Morrow are joking about bringing the finger to Jacksonville. After two nights in Florida, the band is off to Europe this November to play a few shows supporting the Satch album. CT: What guitar do you play on at a Nite Trippers show? Do you have a favorite? DJ: Whatever guitar they got for me at the gig, that’s what I’ll play. It don’t matter to me. We used to endorse Fender guitars, but then, after I got shot in my finger, I endorsed Gretsch guitars for a little bit. Now, I briefly borrowed a guitar from Bobby Hebb, who wrote “Sunny.” It was a Gibson Byrdland, and that was my favorite guitar. I have one but it’s a little weirded out, but it’s OK. I can’t really play it on a gig ’cause it’s got problems with it. CT: Working with Sarah and the band, what’s it like having a music director of her magnitude who not only plays trombone in the band, but is also a composer and arranger—plus having the spirit of an A-team roster of musicians in the Nite Trippers coming together to showcase over one hundred songs from the catalog of your life’s work? DJ: Hey, we easy; we roll. I dig it; it’s something that I really dig. I love what she does with it; that’s the hippest part of it all. She can cook all kind of ways. Listen, I think the band slams, and I think everybody in the band’s cool, but I think also that I feel in my spirit that all of the cats (Nite Trippers) is doing something that brings stuff out of me that’s really positive, you know? I think that’s a good thing; it’s great, it’s a blessing to me for the ones who could feel that. Like any properly infectious motif, the melody can go on for days as if guided by some otherworldly choir. It keeps those words humming within the mind like bayou crickets harmonizing as the swamp sings its song on such a night. But with Dr. John, one notion separates the power of his compositional prowess—there may be other forces at work. To learn more about the over fifty years of musical legacy of Dr. John and the Nite Trippers or for tour dates, visit his official website at www.nitetripper.com.